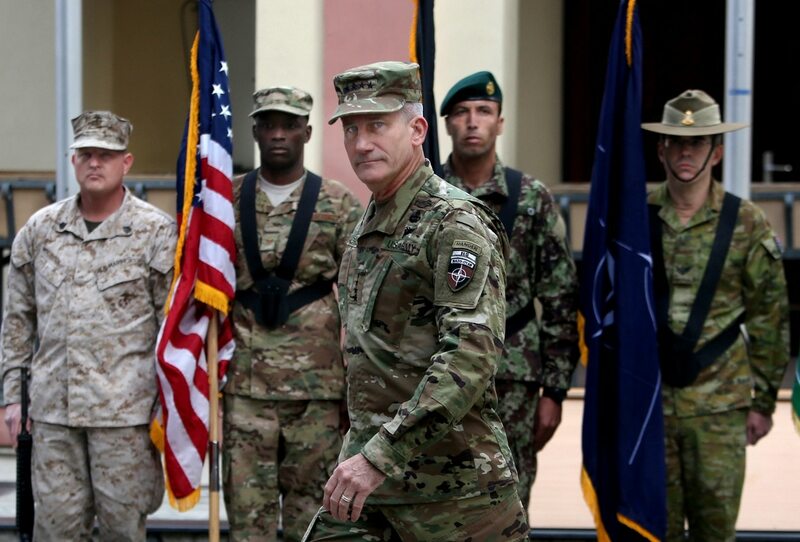 KABUL, Afghanistan — President Obama's decision to allow more aggressive U.S. military action in support of Afghan combat operations against the Taliban could have a game-changing effect on the long war, Gen. John Nicholson, the top U.S. commander in Afghanistan, said Saturday. "The ability to help the Afghan security forces when they are on the offense is really where we want to be, because when they have the initiative, when they are on the offense, when they are taking the fight to the enemy, that's how they're going to be successful," Nicholson said. Ultimately, Nicholson said, this could generate enough Afghan offensive momentum to break the Taliban's belief that they can prevail and compel them to reconcile with Kabul. It's also true that U.S. commanders in Afghanistan have been asserting for many years that enough military pressure can be put on the Taliban to bring them to the negotiating table, but that has never happened. As recently as 2011 the U.S. had 100,000 troops in Afghanistan. "We suspect they're not as high as that," said Maj. Gen. Richard G. Kaiser, commander of the U.S.-led training mission, known as Combined Security Transition Command Afghanistan. He was referring to suspicions that a significant number of soldiers and police officers who are listed on the rolls are actually phantoms; they are kept on the rolls so their salaries can be collected by corrupt commanders. Nicholson, the top overall U.S. commander in Kabul, said he sees many reasons for optimism in light of what he calls a series of events that have boosted the morale of the Afghan military. Among those is the U.S. killing of the Taliban's leader, Mullah Akhtar Mansoor. He was killed in a drone strike in in Pakistan in May.